Purpose: Fitness trackers are surging as millions of people wear them day in and day out. The accuracy of the devices have always been a concern and as such have been the topic of several peer-reviewed scientific studies (study, study, review). However, there is little known about how to maximize "accuracy", leading some to maintain a swinging arm even while carrying heavy items just to "not lose steps". In this experiment Scientific AmeriKen examines the accuracy of two different pedometers under several common scenarios, including one scenario in an attempt to game the system. Hypothesis: Although the devices have several accelerometers to enable the trackers to adapt to multiple situations, it just seems to be common sense that swinging the arm while walking is necessary to maximize accuracy. Scientific AmeriKen further hypothesizes inaccuracies will develop while carrying objects (two handed), keeping a hand in a pocket while walking, and reading a cell phone while walking. 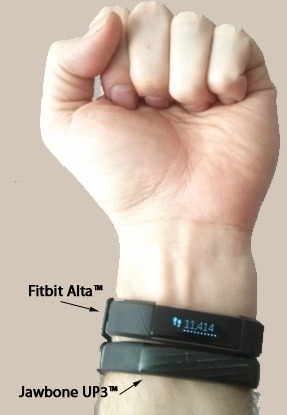 Additionally, manufacturers recommendations are to place the Fitbit on the non-dominant hand, thus our hypothesis is doing the opposite will inflate step counts. The natural: A natural arm swinging motion was used. Left (non-dominant) arm was used per manufacturers recommendations - this was repeated at the start and end. Additionally, the right arm was also tested. The hack (fast): Both sensors were placed on the left arm, which was swinging at nearly double the pace versus "the natural". The runway (Pocket): Both trackers were placed on the left arm and the hand was placed in the pocket for all laps. The zombie (cell): Both hands were used to hold and read a cell phone throughout the duration of the walk. The carry: A container of roughly 20 lbs was carried using both hands. 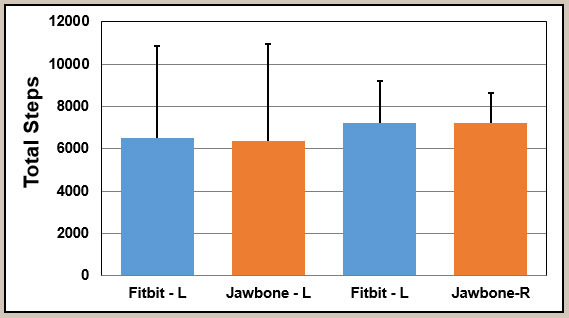 Results: Steps were averaged after 5 total days of both trackers on the left arm (Figure below - A), and then 5 days with the Fitbit on the left (Fitbit - L) and the Jawbone (Jawbone - R) on the right. Our data show the trackers provided similar information regardless of what arm they were on. 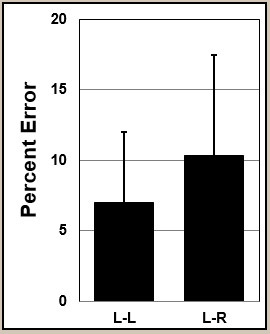 The average daily error was calculated for the first 5 and last 5 days (Figure below - B), here the error for both sets was roughly 7-10%, or about 100 steps per 1000. Next, the two trackers were tested in various configurations (refer to methodology) on a loop of known steps (Figure below, black bar - about 460 steps). Our results show the two trackers were fairly accurate for many of the tested scenarios, except for, surprisingly, the way it should be done. Discussion: Many surprising results occurred in this experiment that utterly destroyed our hypotheses. To start, the very surprising result that using the device as one should would lose Fitbit users steps. The result was so surprising that it was reattempted with the same result. The result may be specific to that test condition though as no difference between right and left hand was observed in the full usage phase of the experiment. Even more surprising though was that keeping a hand in a pocket, carrying something, or even staring at one's cell phone did not phase either tracking device. 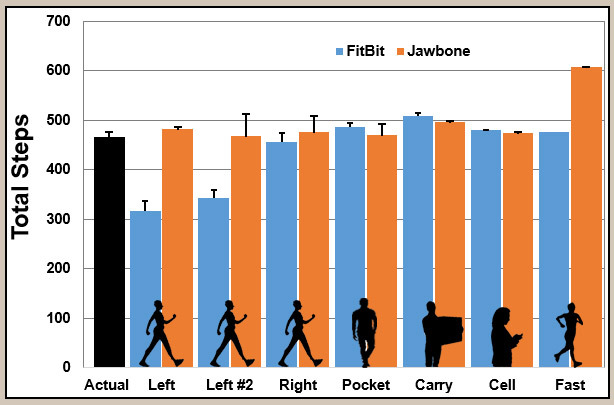 Importantly, the final test proves both devices can be gamed to over report steps by quickly swinging the arm, although as this only led to an accurate reading by Fitbit, perhaps this is how Fitbit users are supposed to walk. Conclusion: Scientific AmeriKen concludes that both tracking devices adapt well to everyday situations to provide accurate step count data. We do note that our study says nothing about the accuracy if you were to do some real exercise.